WAVES officer's uniform in the rank of Lieutenant Junior Grade. Navy blue jacket with matching skirt. Jackets for enlistedWAVES had blue Navy plastic buttons. Qualified personnel wore rating badges and distinguishing marks on the left sleeve. 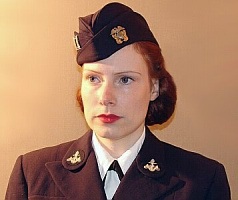 Jackets for WAVES officers had gilt Navy buttons and reserve blue sleeve braids indicating the rank. Staff or line insignia were sewn above the braids on both sleeves. Navy blue shirt worn with reserve blue tie. Reserve blue shirt with black tie for work. The service dress was made of navy blue woolen cloth. Officers were allowed to obtain additional uniforms of worsted wool or gabardine for spring and fall. The jacket had a four-button front and the collars had rounded ends with peaked lapels. The jacket had two upper pocket flaps (without real pockets underneath). Instead, there were two inside upper pockets. ... The 6-panel skirt had six gores with two inset pockets at the front. . Some jobs required the wear of slacks. These were made of the same material and matched the color of the jackets being worn. 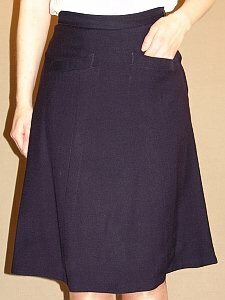 The slacks were pleated at the waist, had two side pockets and were closed with a zipper fastener. 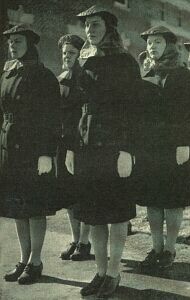 Slacks for WAVES were introduced in February 1943. 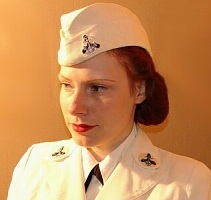 The Service Dress, Blue B consisted of the same items as Service Dress Blue A except that the cap was worn with the white cover and white gloves instead of black ones. 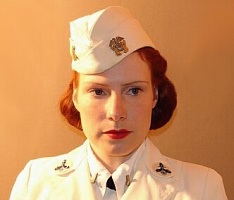 A female style garrison cap for WAVES was authorized in early 1945. 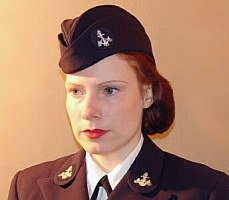 The garrison cap worn with the service dress blue was made of navy blue wool matching the service jacket and skirt. A white handbag in the same style as the black handbag could be carried with the Service Dress, White. The black handbag could have a white fabric slipcover (but the black shoulder straps had to be removed). The picture shows the uniform of a WAVE officer in the rank of an Ensign. (Enlisted Personnel) ... The overcoat for enlisted personnel was made of navy blue woolen cloth. The double breasted front had a double row of four blue Navy plastic buttons. The coat was closed with three main buttons on the left side. If necessary, it could be also worn buttoned at the neck using the uppermost left button. The collar had rounded ends and peaked lapels. 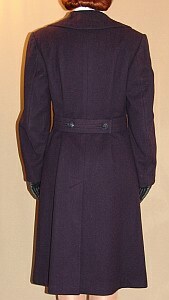 The coat had two vertical, welted pockets at the front. The wearing of mufflers made of white silk, rayon or wool was optional. . The back of the coat was held by a one or two piece half belt. The two piece belt was closed with two blue Navy plastic buttons.
. The overcoat for officers was the same as for enlisted WAVES, except that it was equipped with gilt Navy buttons and reserve blue sleeve stripes indicating the rank. . Raincoat. .. 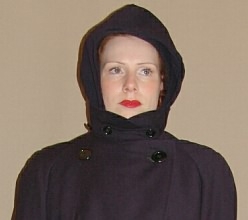 The double breasted raincoat had a double row of five navy blue plain plastic buttons and was made of navy blue, water repellent fabric. It had raglan sleeves and a full belt. Its collar was convertible like the overcoat collar. Additionally, it had a storm tab. 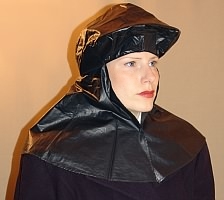 The raincoat was equipped with a removable liner. No distinctive WAVES features and no insignia were worn on the raincoat. .
A rain hat cover called "havelock" was available in winter and summer weight material.
. The havelock for summer wear was made of navy blue water repellent material. It was so constructed that it could be worn over the hat with the brim fitting into a flap in front of the havelock. The full cut side of the havelock hung down to the shoulders. ..